­­Pittsburgher Erik Schark (pictured left) gathers regional MT composers, lyricists and bookwriters for monthly meetings, but after only a few months Erik takes a new job in Oklahoma. MTAP sputters a little, but an idea this good isn't going to disappear entirely. Stephanie Riso and Jeanne Drennan revive what Erik started and with a focus on new work. Meeting in a basement classroom of the University of Pittsburgh's Cathedral of Learning, both old and new members begin bringing in work in progress and presenting it to the group for comment. Steve Cuden, co-creator of Broadway's Jekyll and Hyde, the Musical, comes to give a talk to members and winds up coming on as MTAP's artistic advisor. Member Laura Lind finds the group a better meeting space in the Wightman School Community Building. The group grows little by little; the focus remains on presenting new work for group feedback. The itch to go public demands attention. Stephanie, Jeanne and Steve conceive of Hot Metal Musicals, a showcase of new member songs. It plays to a full house in the Cabaret Theater at Theater Square, downtown, launching our cooperative arrangement with the Pittsburgh CLO. Later in 2015, members begin self-producing readings, both private and public, of parts or all of their musicals: Jeanne Drennan and David Berlin with Dear Boy, and Sandra Lowell and John Keating with Kitty. A song in 2015's Hot Metal Musicals registers with one of the producers present, and Murphy's Law by Andy Nagraj and Jonathan Spivey is produced in the spring by the Strand Theatre in Zelienople. MTAP inaugurates the Incubator reading series, presenting public readings of three works-in-progress: Dear Boy, Eva Rainforth's Me, Myself and Others, and Stephanie Riso's The Storm. 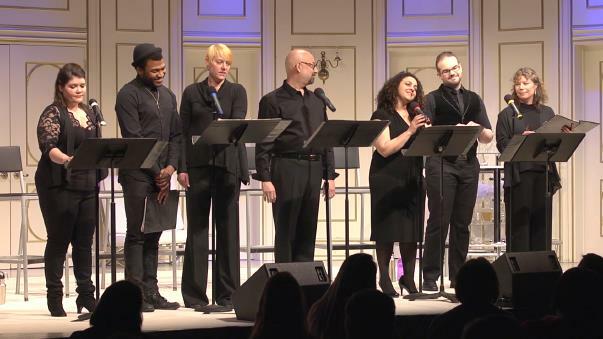 Member Frank Gagliano revives his From the Bodoni County Songbook Anthology in a public reading at Carnegie Stage. The second edition of Hot Metal Musicals plays to a full house at the Cabaret Theatre. After a very competitive selection process, Carla Bianco's Kaleidoscope is selected for the sole Incubator reading slot in 2017. (who sold sea shells by the seashore) and of Jeanne Drennan's Juiced! MTAP continues as an all-volunteer collective dedicated to building new musicals from the ground up. It relies on grants, donations, and partnerships with other arts groups to make its programs possible.